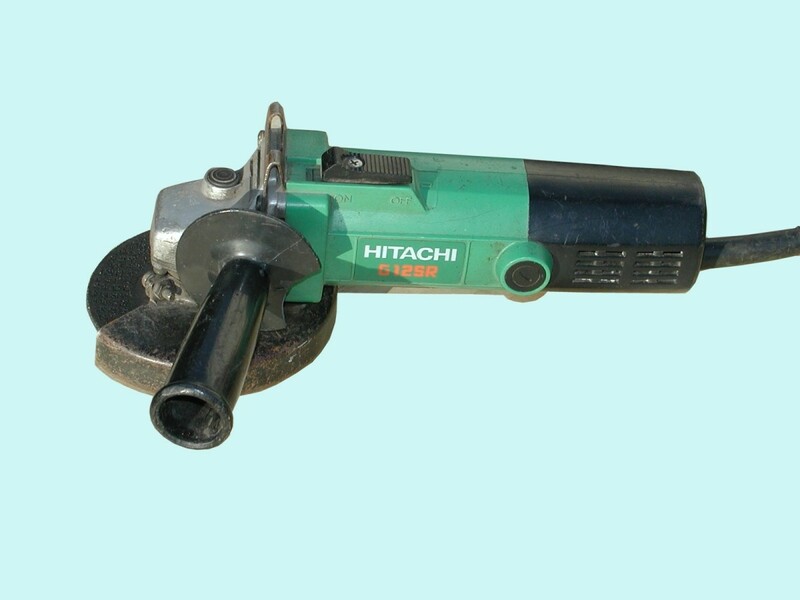 An angle or hand grinder is a power tool regularly used by construction workers and contractors. However, it's also an invaluable tool in the home workshop or around the house, with a multitude of uses for DIY and crafts. 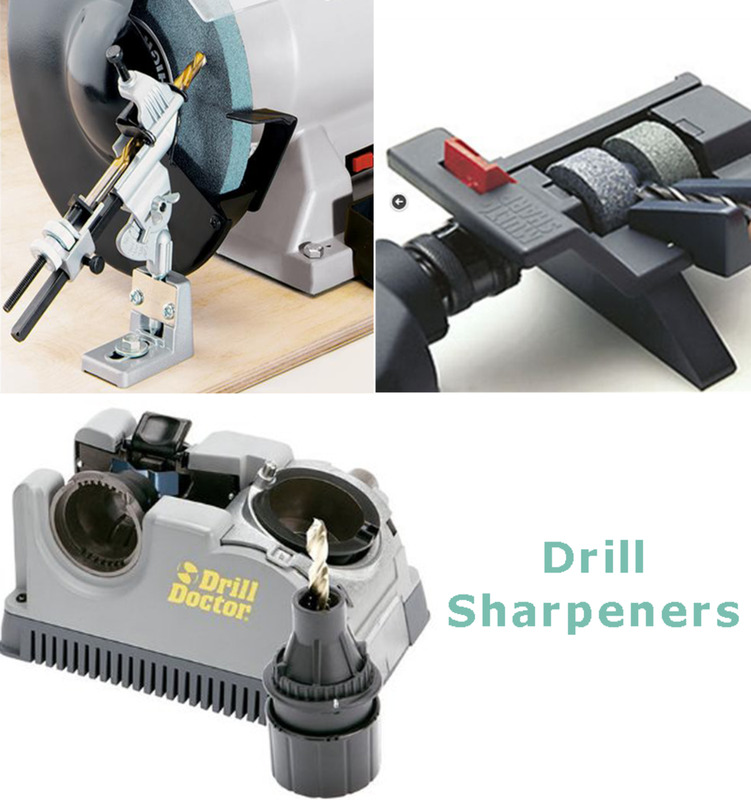 As the name suggests, it can be used for grinding and cutting but also sanding and wire brushing. But like any power tool, grinders can be dangerous if used incorrectly. This guide shows you what safety precautions to take before and during cutting and how to cut properly. What Are Angle Grinders Used For? If you need to cut up stuff for disposal in your trash, an angle grinder is invaluable. Sure, you can use a hacksaw for doing most of these tasks, but a grinder is super quick. Angle grinders make use of a disk of abrasive material spun at a high rotational speed by an electric motor in order to perform the cutting action. Angle grinders can be powered by compressed air or gas (petrol). However, mains powered or cordless versions are the most most likely types to be used by the average DIYer. What Are the 5 Safety Precautions When Using an Angle Grinder? 1: Make Your Work Environment Safe ! All work environments need to be safe, but when using a power tool, a trip or fall can result in a serious accident. Tools are often driven by powerful motors or engines and the business end of the machine can be an abrasive cutting disk, a blade with sharp teeth or a sharp drill bit. As the saying goes "flesh is no match for steel", so safety is paramount. De-clutter Your Workspace. 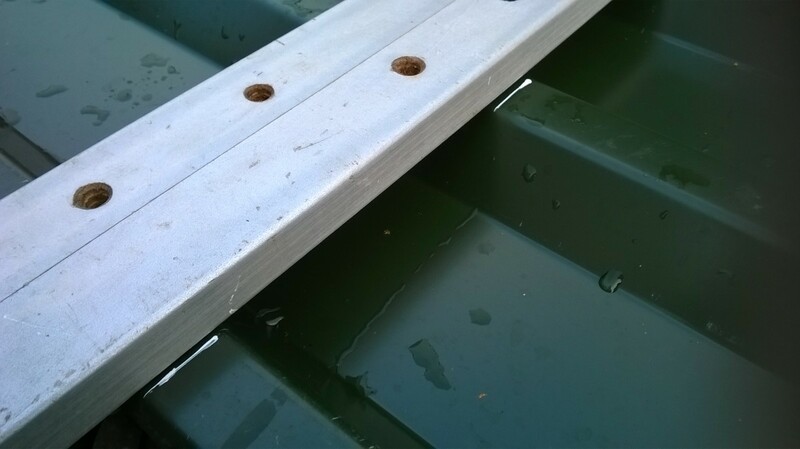 Tool boxes, scattered tools, lengths of steel and timber and power cables can cause trips and falls. Keep everything to one side where it can be accessed if needed. Power Cables and Flexes. Keep these behind you so they can't end up getting cut or tripping you up. Provide Adequate Ventilation. 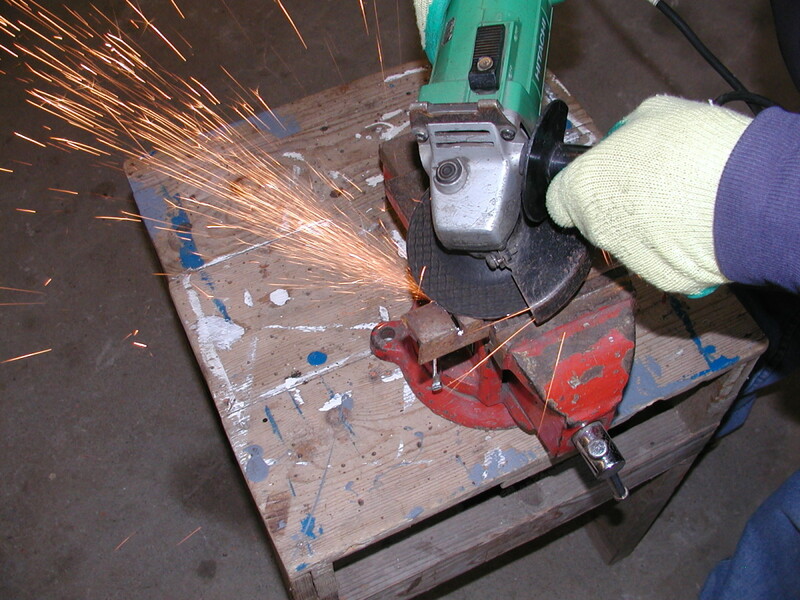 Grinding and cutting will produce dust and metal particles, sparks and fumes. Open doors and windows and try to direct sparks away from you. Flammable Materials. Remove gasoline(petrol), diesel, gas cylinders, solvents, sawdust and other flammable materials from the work area. If this is not possible, direct sparks away from these items. Paper and oily cloths are also a fire hazard. Rain and Water. Don't work during rainy weather or use a tool which has become wet without drying it thoroughly. 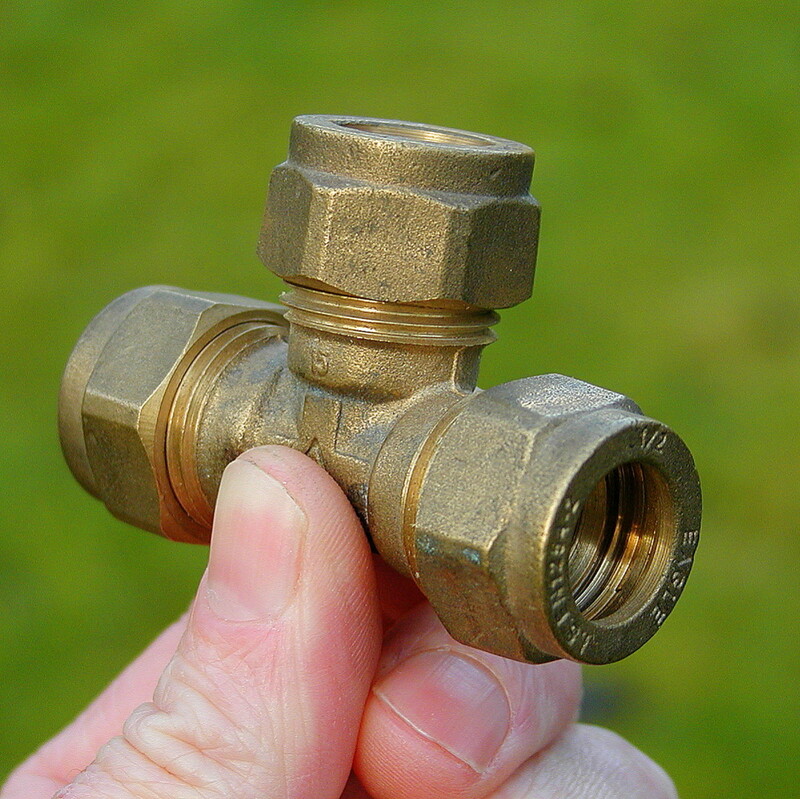 For added safety, power the angle grinder from a socket or extension lead fitted with a GFCI (RCD) adapter. 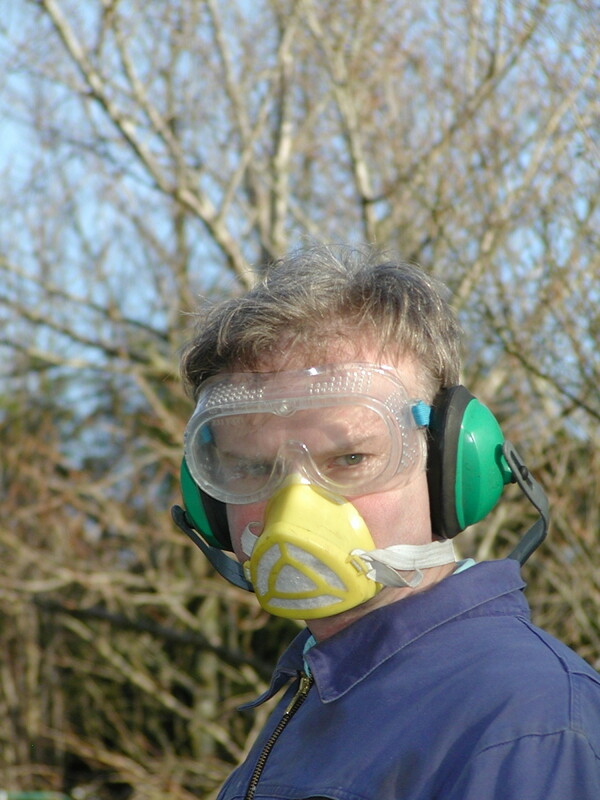 Personal Protective Equipment (PPE) should be worn to protect your hearing, lungs, eyes, hands and feet from injury. Clothing and gloves should be tight fitting so that they don't get caught and pulled into the tool. Eye protection. Safety goggles need to be worn to protect eyes from flying particles and sparks. These should be to EN166B , ANSI Z87.1 or equivalent standard. A full-face visor/shield gives additional protection should the disk shatter. Ear Protection. Muffs or earplugs will lessen the risk of hearing damage. Hand Protection. Gloves provide protection from sparks, and small fragments of disk and waste metal thrown out by the disk. They also protect your hands from general wear and tear, i.e. minor cuts, scuffs and abrasion. Gloves may give some protection from hot sharp edges of cut metal, but this depends on the rating of the glove and thickness/material used. Some people advise that gloves should never be worn when using an angle grinder because the tool could be classed as rotating machinery and gloves could get caught in the disk. However, this shouldn't happen during normal use as both hands are holding the grinder and the guard should be in place. In any case, gloves should be tight fitting and not "baggy", so that you can hold the tool securely. Breathing Protection. Use a suitable dust mask to protect against fumes and dust particles. This should seal properly around the face. Tiny particulate matter (dust particles) entering your lungs over a prolonged period can eventually cause lung disorders, maybe even cancer. Footwear. Wear steel toe cap shoes or boots with good grips. If you are working with heavy items which could drop when cut up, this will protect your toes. Footwear should also incorporate steel insoles to protect feet in the event of walking on nails or other sharp objects in the work area. Overalls and/or Leather Apron. These protect clothes from sparks. Watch out for sparks falling into pockets or turn-ups. Flex and Plug. The flex should be securely attached to the tool and plug. Exposed cores in the flex at these entry points (where damage often occurs), should be remedied by rewiring the plug or grinder. Cracked and damaged flexes with exposed inner cores should be replaced. Check the Guard. 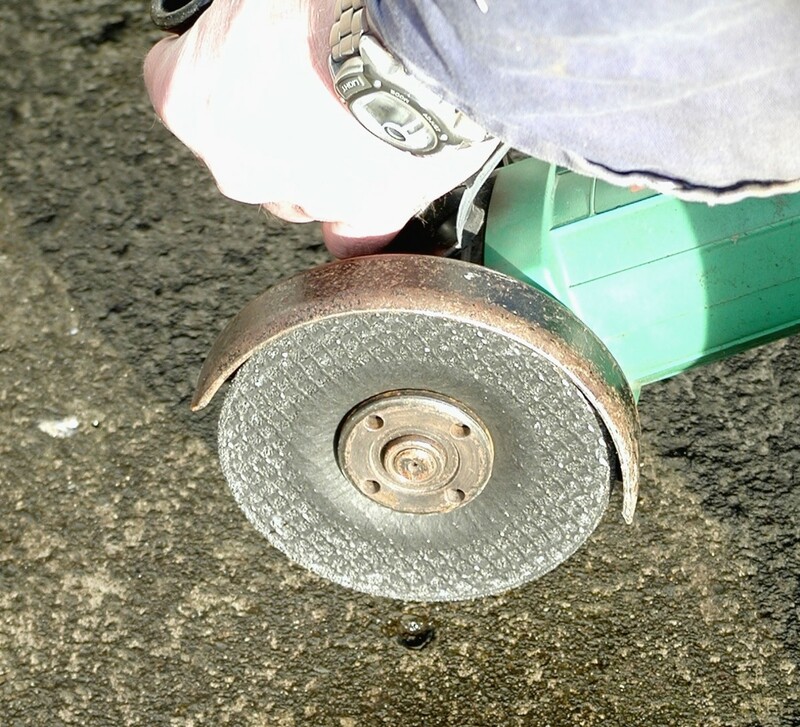 The guard on an angle grinder is an essential component which should be in place at all times. It protects the user from sparks thrown upwards and backwards and also takes some of the impact if the disk shatters, by deflecting chunks of material downwards. It also may give some protection for your face if the grinder falls back against you while grinding overhead (a practice which you should try to avoid. If there is no alternative, always wear a full face visor). The guard should be adjusted to the correct angle, giving maximum protection by deflecting sparks and disk fragments towards the ground. If the grinder needs to be used in a confined location or to make a vertical cut, the guard should be adjusted to suit. Usually it is only necessary to loosen screws or a bolt, twist the guard and re-tighten the fastener. Any build up of slag on the inside of the guard should be periodically removed. A secondary but equally important function of the guard is to shield the back of the disk from making contact with your hand, potentially causing a serious injury. 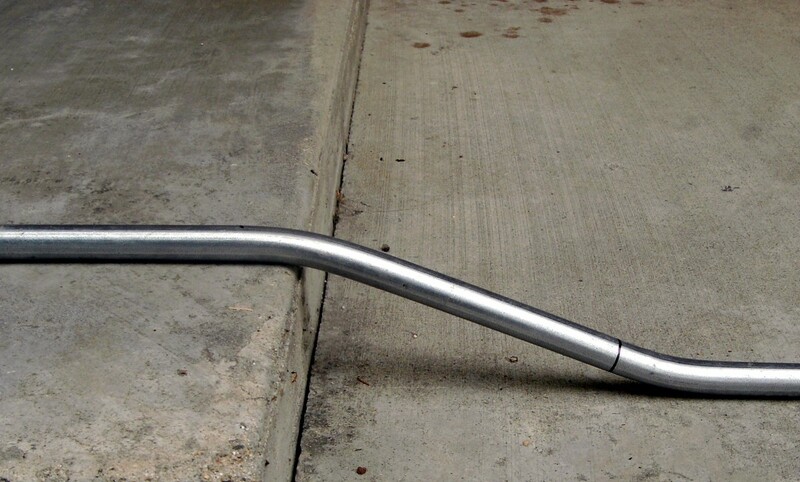 Side Handle. This should be tightly screwed into the tool. The "hollow" on a depressed centre disk should be facing outwards. A shattered disk can kill! If you need to cut stainless steel, special disks made from a hard abrasive material can be used, which won't wear away as quickly. 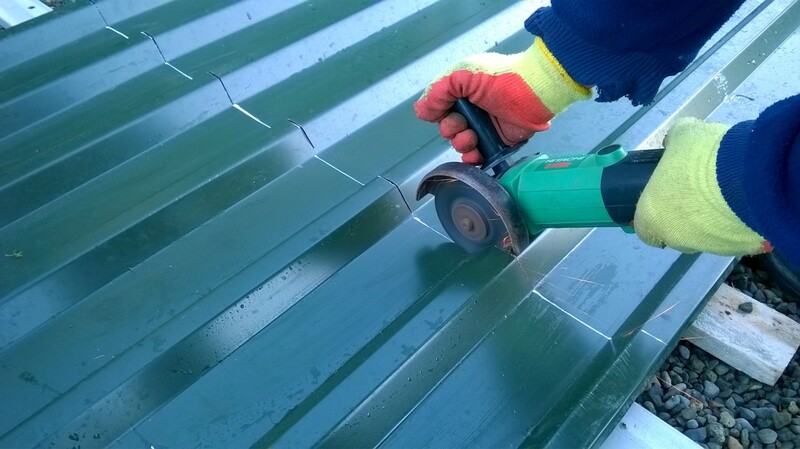 Thinner disks are available for cutting metal sheeting such as roof cladding. These cut quicker with less friction so there's less damage to protective coating/paint on sheets. However, they also wear away somewhat quicker. 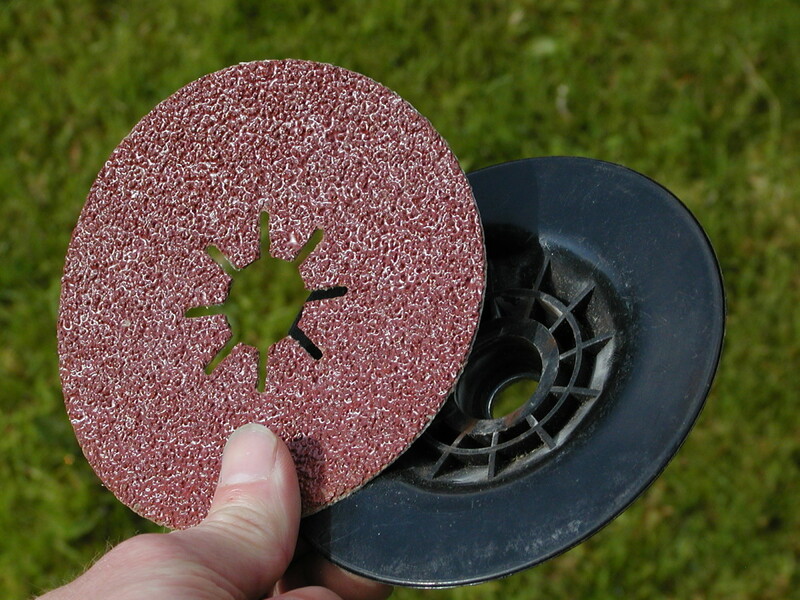 Diamond abrasive disks can be used for cutting brick, stone, concrete, slate and roof tiles. 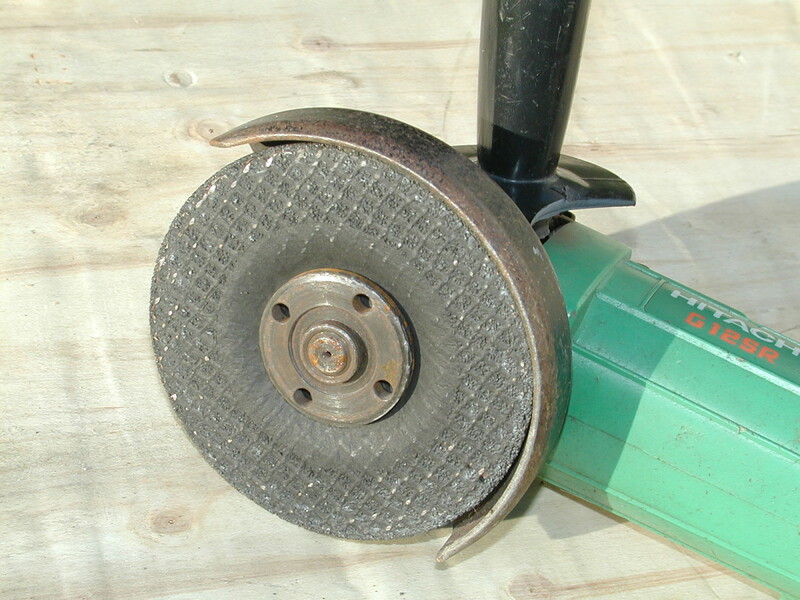 Angle grinders are commonly available in 4 1/2", 5", 6" and 9" sizes. Air powered grinders are also available. Never use cutting disks for grinding! 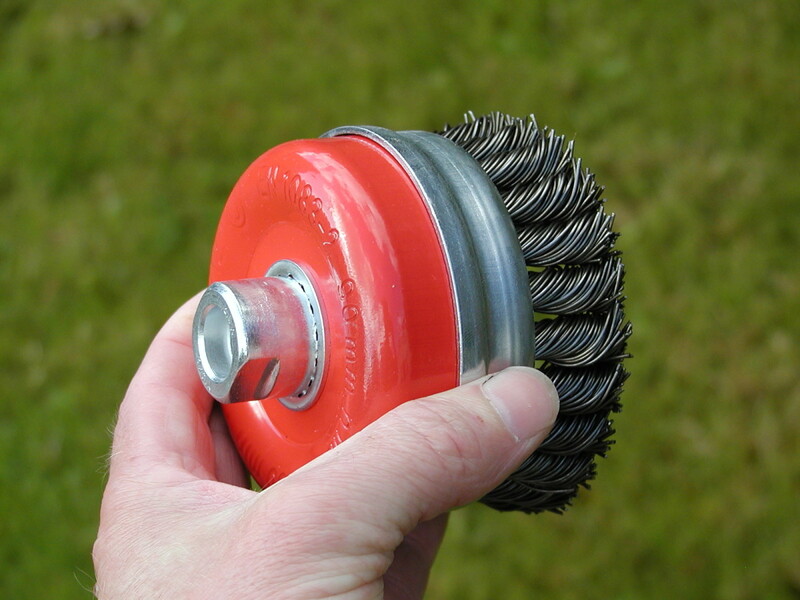 Wire brushes are available for cleaning and removing rust and paint from metal and wood. These can fling out steel bristles so you need to wear eye and face protection. You can also use sanding disks. These attach to a rubber/plastic pad fitted to the grinder. 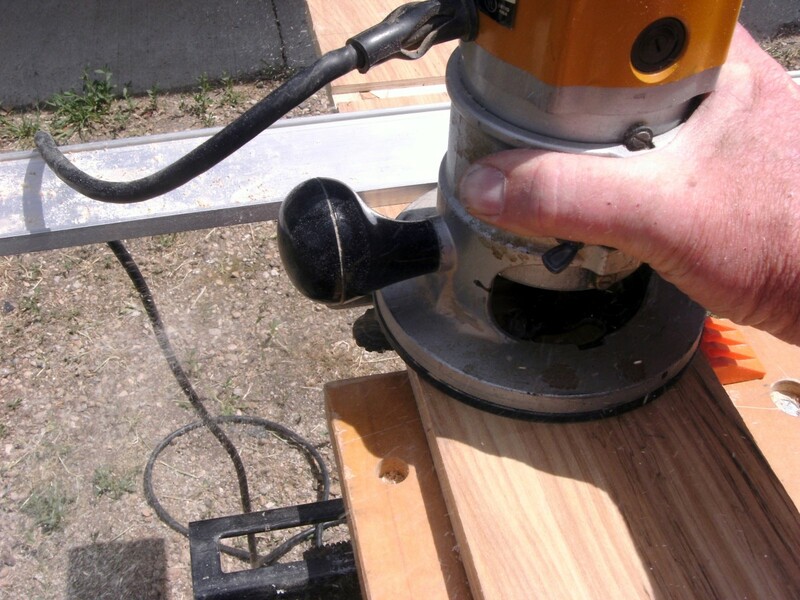 A sanding pad can get into spaces inaccessible to an orbital or belt sander. Don't use attachments not designed for the grinder, e.g. circular saw blades. Read your manual before use and become familiar with your power tool. Be alert at all times and watch out for the unexpected and others coming into your workplace. Children should never be in the vicinity while using dangerous power tools. Don't use an angle grinder in the rain because you may end up getting an electric shock. The shock could startle you and the likelihood is that you could drop the grinder and potentially cause injury to yourself. If possible, don't use a grinder overhead you because if you lose control, it could drop down on top of you. Don't use a grinder if you are tired. Tiredness can result in poor concentration and the possibility of an accident and personal injury. Keep your feet spread apart. This braces your body better and makes it less likely for you to be thrown off balance. Ensure that the power flex and any extension cords are behind you and can't fall into the path of the cutting disk. If the work-piece isn't heavy, hold it in a vice on a bench or clamp it to a surface. Never hold a piece of metal in your hand to cut it! I did this once and the grinder disk caught in the metal, flung it up into the air, and I didn't find it until a month later on top of a shelf! You can usually hold a length of metal down by standing on it with two feet, however, it's questionable whether this is safe. The danger is that the disk could snag in the metal and rip it from under your feet, causing you to lose your balance, especially if you're using a 9-inch grinder. If cutting outdoors, lengths of steel can be supported on short sections of 9 x 2 or similar so the disk doesn't make contact with the ground. Position the cutting point so that it overhangs the support. 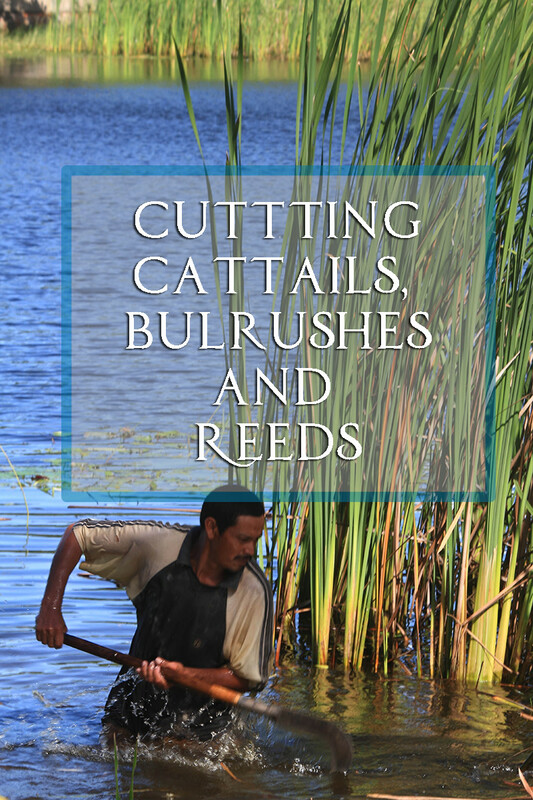 This ensures that the weight of the waste will open up the cut as the material falls away. Don't cut in the span between two widely spaced supports. The cut may close up as you cut through, potentially causing the disk to bind. Hold the tool with a firm grip using both hands. Keep one on the body of the grinder and trigger and the other hand on the side handle. While I have sometimes used a grinder with just one hand, this is not recommended. If the disk gets stuck in the work-piece, it is almost certain that it will be pulled out of your grip and potentially cause an accident. Even while holding a grinder with two hands, you need to be prepared for this, especially when using a large 9-inch grinder. 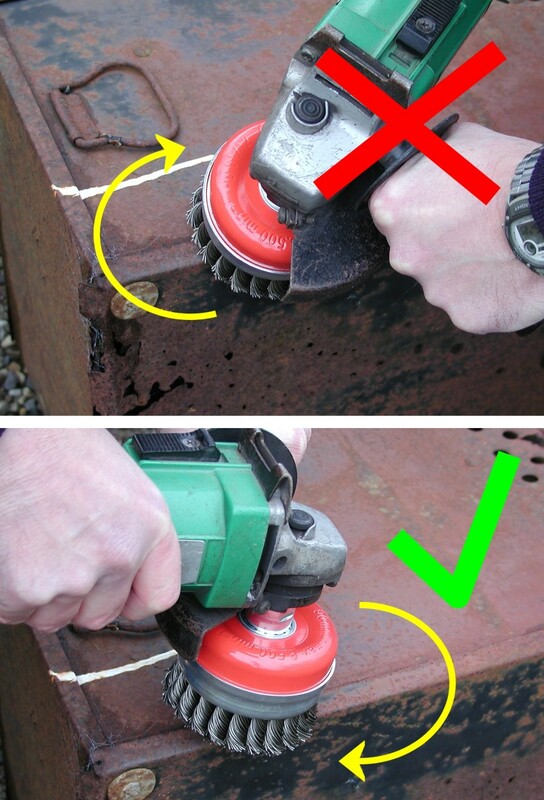 If the disk binds, release the trigger immediately to avoid burning out the motor and if the disk is still turning, allow it to come to a stop before removing it from the cut. If you are cutting, you will probably have a guideline drawn on the workpiece. Start the grinder, allow the disk to reach max speed (Large grinders may have a slow start-up feature to prevent the "kick" on power up) and place the disk gently in contact with the back of the work-piece so that you cut towards yourself. You can cut from the front of the workpiece, however, it can be more difficult to control the grinder as the disk tries to climb out of the cut or moves down in front of the edge of the metal being cut. When cutting from the back, the disk is less likely to drop over the edge as the workpiece is under the back of the disk. Brace your arms in case the grinder kickbacks in the cut. If you are cutting on the ground, keep your legs out of the way in case the grinder slips. 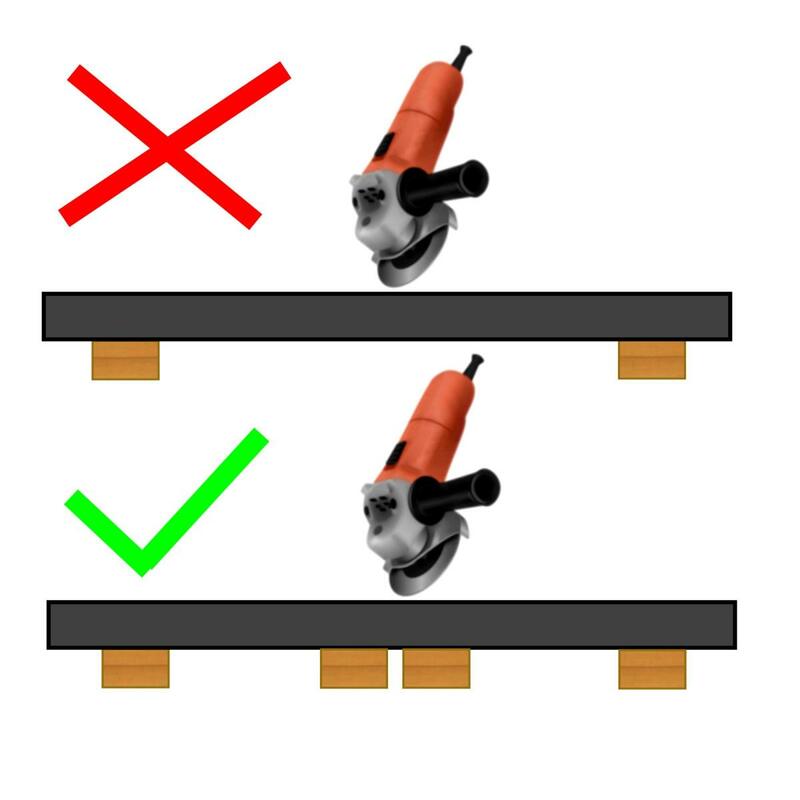 If a climbing cut (cutting from the front of the workpiece with sparks being thrown downwards) is essential because material must be cut in place and can't be held in a vise, make sure sure you keep your head out of the way. Otherwise, you can be hit in the face if the grinder kicks back upwards. This is why I reckon it's safer to cut stuff on the ground where it's at arm's length and further away from the face. Apply gentle and constant pressure and the metal will start to become red hot. At this stage, it becomes softer and cuts easier. Don't force the disk into the cut. This can overload the machine or cause it to catch on the workpiece. 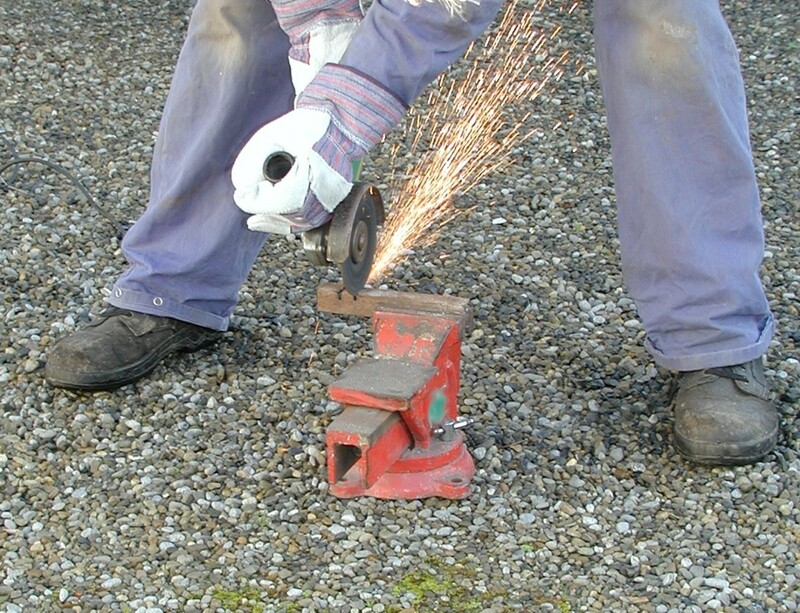 Angle the grinder so that sparks are thrown backwards either to one side of your legs or between your legs. Don't allow them to concentrate on one point on your clothes for any length of time or they will cause them to ignite (been there, done that!). A leather apron although cumbersome will protect clothes. Keep the disk straight and avoid twisting it in the cutting slot to prevent it sticking and causing kickback. If the disk binds, it can shatter or throw out fragments. When the waste is almost cut away, take care that the disk doesn't get trapped. Cut through the material and allow the waste to fall away or move to one side. Remove the disk from contact with the material, release the trigger on the grinder, allow the disk to spin down to a stop, watch out that you don't scuff the flex with the disk and only then allow it to rest on the ground. The workpiece and waste will be extremely hot at this stage, so allow them to cool down before handling. Don't walk around your work area while holding a grinder which is powered up. This applies to all power tools. Grind off sharp edges on the workpiece and waste (if it is being reused). Keep your two hands on the grinder at all times and hold it firmly until you release the trigger and the disk comes to a stop. 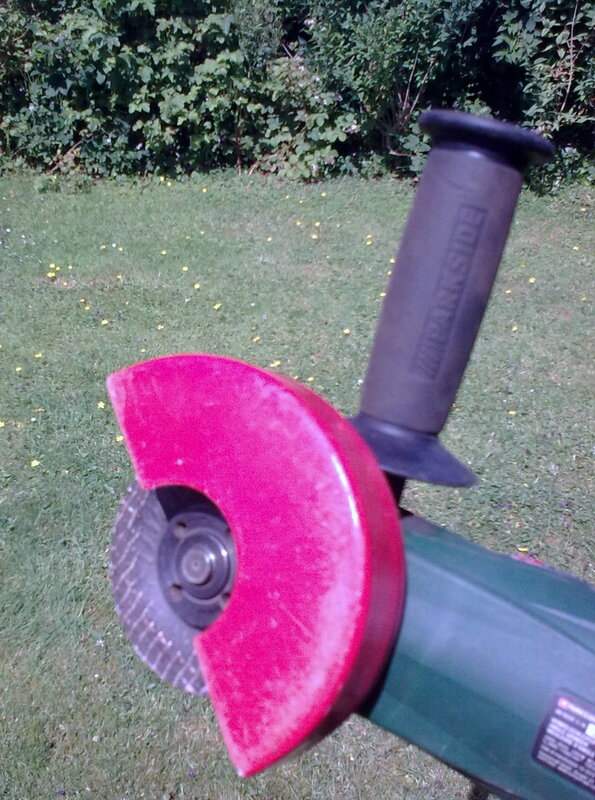 If you use the grinder single-handed, you risk losing control of it. I have had minor accidents while moving a grinder while holding it with one hand and not keeping track of where my other hand was. Luckily these were just minor scuffs. This is why it is important to wear gloves. 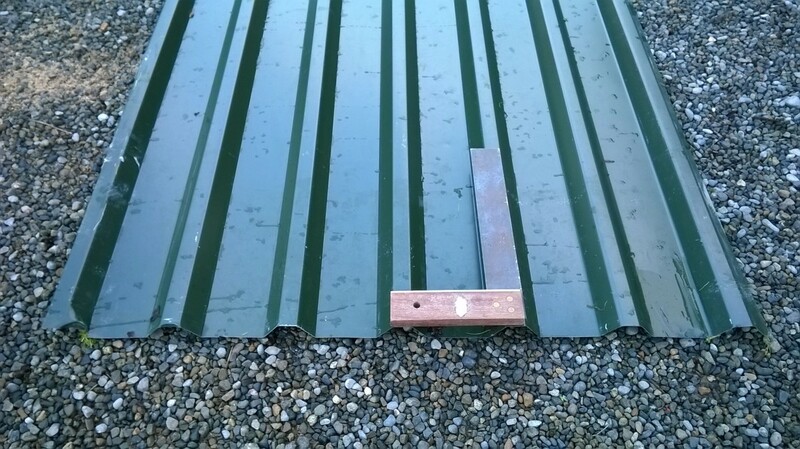 It's probably safest to cut on the ground if you're cutting long sections of metal because they can be supported underneath and only drop a few inches as waste is cut away. Also, the grinder will be low down and less likely to cause an injury if for some reason it dropped out of your hands. Unfortunately, if you have a lot of material to cut, and do this on a regular basis as part of your job, this practice would probably cause back strain long term. So cutting at waist level would be advisable. Never hold the workpiece in your hand while cutting. 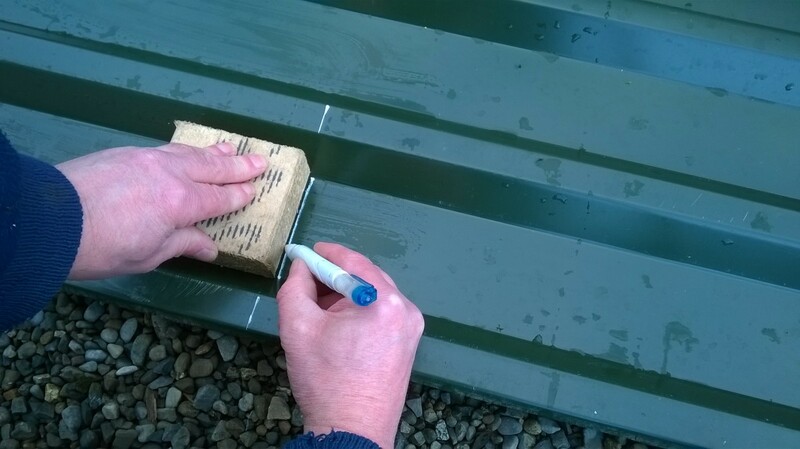 The best way to cut metal cladding is to first mark the cut line using a Tippex style marker. Then cut through the ridges first, followed by the valleys. I found the best way to avoid kickback is to cut the ridges from the back, pulling the grinder towards me, then cut the valleys, pushing the grinder away from me. 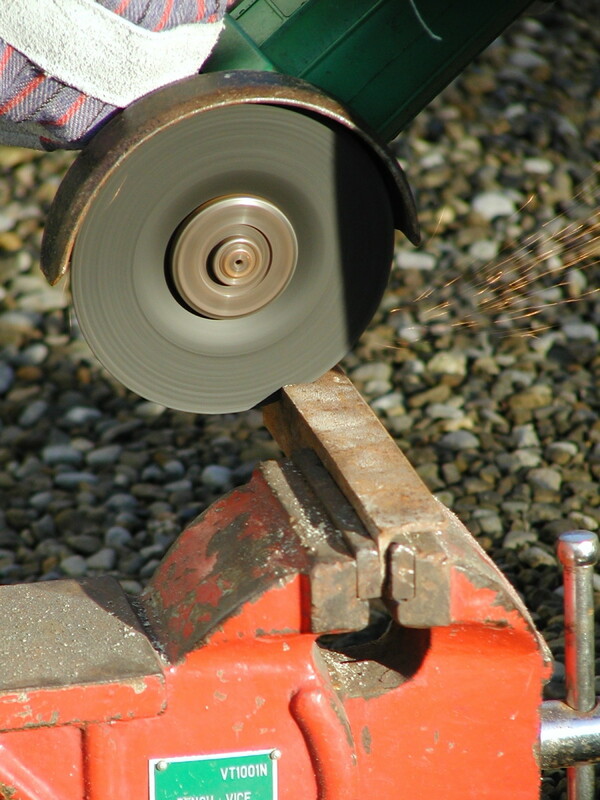 Because cladding is so thin, the disk can tend to catch in the edge and the grinder will jerk. So you need to experiment to avoid this. If you can imagine a tangent to the edge of the disk, this should be at an acute angle to the sheet to avoid catching. In any case, use light pressure to reduce the chances of this happening. Thin disks as used for stainless steel are best for minimising friction and avoiding burning of the paint coating. This G12SR4 model from Amazon is rated at 6.2 amp / 110 volts (680 watt). This is a good general purpose grinder, adequate for cutting and grinding most stuff around the home (this is the latest version of the grinder I use in the photos). You can also use it with a wire brush for de-rusting and removing paint. Higher powered versions are available up to 1000 watts from this advertiser for quicker cutting through heavier material. Grinding by its very nature may involve using the grinder at all sorts of angles. Try to direct sparks away from you and watch out where they land. Remember all flammable material should have been placed safely out of range. Again watch out for kickback so you need to hold the grinder firmly. Re-adjust the guard if necessary to shield yourself from sparks and angle the plane of the disk at about 30 degrees to the workpiece. Take care when using a wire brush. Tilt the grinder slightly so that the edge of the brush furthest away from you spins out over the edges on a workpiece. If the bristles move towards an edge, they can cause the grinder to jerk and kickback if you apply too much pressure. Where Should You Keep Your Head?! Debris is thrown out in the plane of the disk and the guard should catch anything which comes in your direction.This is why a guard should be used at all times. If you offset your head to one side, you should be out of this plane, and I reckon this is the safest thing to do. However theoretically, a thrown fragment could hit the edge of the guard, be deflected and hit you. In any case, it is easier to keep your head to one side to see what you are doing. Some grinders are provided with a guard which encloses both sides of the disk for added security. However this can be more cumbersome and obstructive while working. 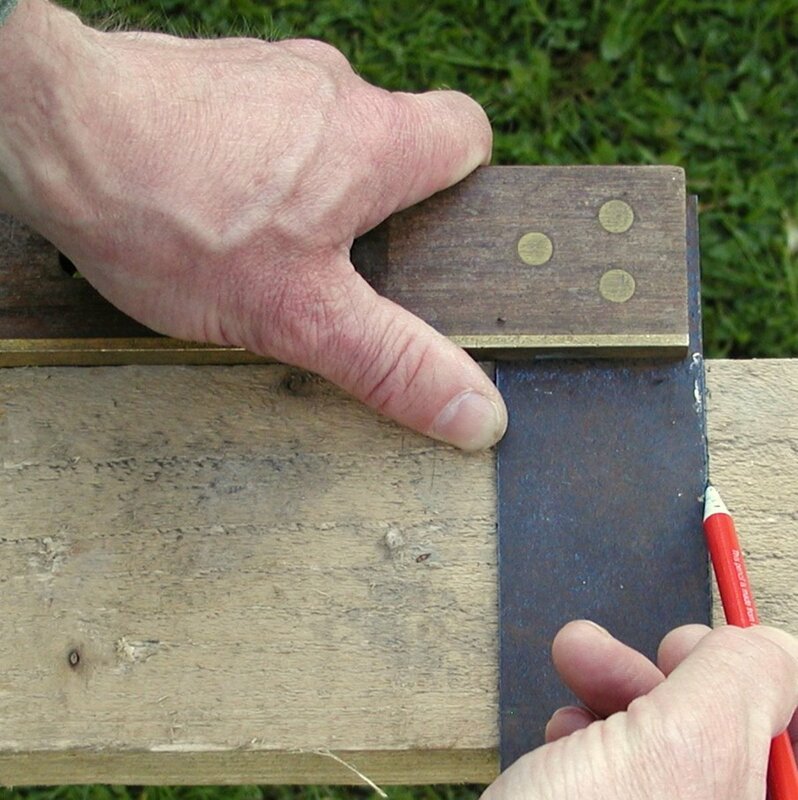 If you want to accurately cut box section steel, mark all around the perimeter using a square and scribe tool or Tippex marker and then cut each of the four faces in turn. You can also buy a jig which holds a grinder onto a hinged arm which can be raised up and down so that square cuts can be made. 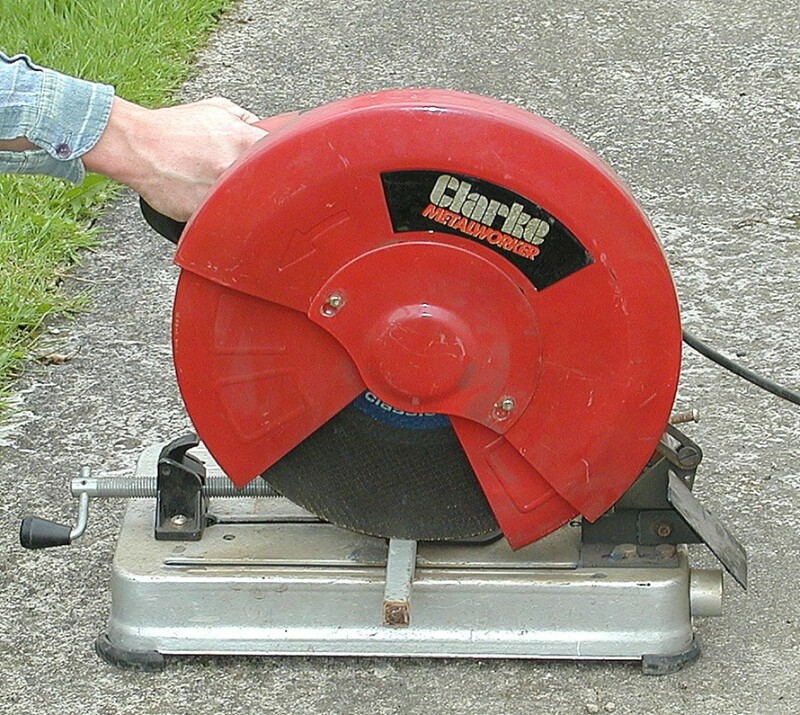 An alternative is a metal cutoff saw. These usually have a 12 inch abrasive, or tungsten carbide tipped blade, enabling accurate square or mitred cuts to be made on hollow or solid section steel up to 4 inch in cross section. Ideally you should wear gloves to protect your hands from rust, oil and other grime on the material you're cutting. However you may need to dispense with gloves in order to do any marking out/fine work, and inevitably grime will end up on hands. A hand cleanser will do a better job than soap at removing grime, and many cleansers contain a fine abrasive (just like toothpaste does) which helps cleaning. When you use any hand cleaner, it's a good idea to use a moisturizer afterwards to replace the natural oils washed from skin. This prevents cracking or uncomfortable dryness if you suffer from eczema/dermatitis, psoriasis or other skin conditions. This hand cleaner contains pumice, which acts as a mild abrasive. Ideal for removing the grime which inevitably gets on your hands from handling steel. 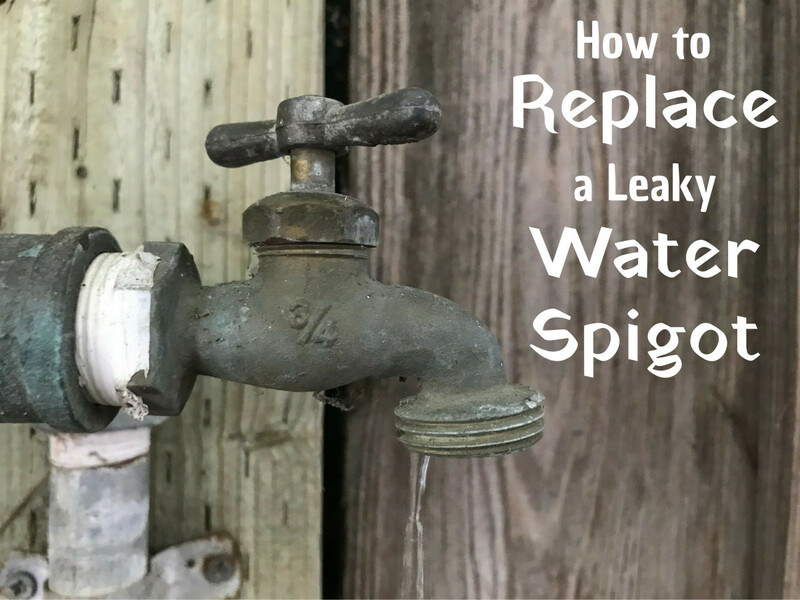 Recommended also for removing resins, oil, grease, tar, soil, printers' ink, epoxies, paint, rubber cement, gasket and tile cements. there should be a section about metal finishing with the grinder. Personally I would use the word "snag" to mean catching or seizing on an edge. E.g. fabric catching on a jagged edge. So for instance a disk might catch on the edge of sheet metal when cutting rather than abrading it away. Then the disk could bounce as the operator tries to control the grinder and maybe impacts it with a surface. Another possibility is that a disk isn't seated properly with the shoulder on the bushing not fitted properly into the central hole of the disk. The circular flange/nut piece could be tightened, but the disk would be off centre by several mm and then bounce on the work piece as it rotates. It would eventually wear into a circle as the "cam" section wears away. Hi, Would you be able to offer a descriptive explanation as to the difference between 'snagging' and 'bouncing' when using an electric angle grinder? We have had an incident with injury and the use on the disk suggests that it bounced rather than snagged and I am looking to see if there is a evidence to suggest there is a distinct difference between the two. It sounds drastic. You could use a grinder, but it would take forever to do it, especially if the frame is solid. That much material would need to be cut off rather than ground away. If the frame is aluminium, the disk can also clog up. If the section that has to be removed is just a narrow strip it would take less time, but still be awkward. It could also generate lots of sparks if the frame is steel, metal dust and likely set off fire and smoke alarms. It's not something I would recommend doing indoors in a building. If you start messing about with the door, it could weaken it and might also affect your insurance. The door would also look terrible with a piece ground out of it. If I was to remove a small strip of metal (i.e. 1/4 inch by maybe not more than 1/8), I would probably use a reciprocating saw, but again it's not something I would recommend! Could you use a grinder to "shave" a 1/4 inch from a metal door frame? Our measurement was a 1/4 of an inch off for our new fridge to fit through kitchen door that has a metal door frame. We do not have a door there just the frame; however, we just finished everything on kitchen so don't want to re-demo to remove door frame. Plus we live in a NY apartment building and may not be able to get building approval to remove for structural reasons. Also the appliance company will not take the fridge back, which is why I am looking for a way to get it in. Do you think it is possible to sand out the metal door frame enough to fit it through? 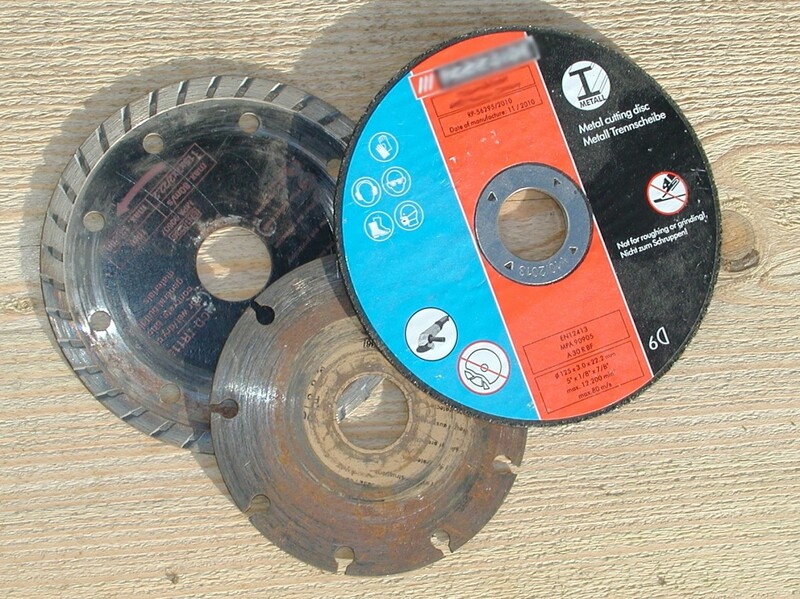 Disks are really designed for cutting steel, stone, sheet metal, thin waste pipe etc. When cutting these materials, waste material is thrown out of the cut and carries the heat with it. 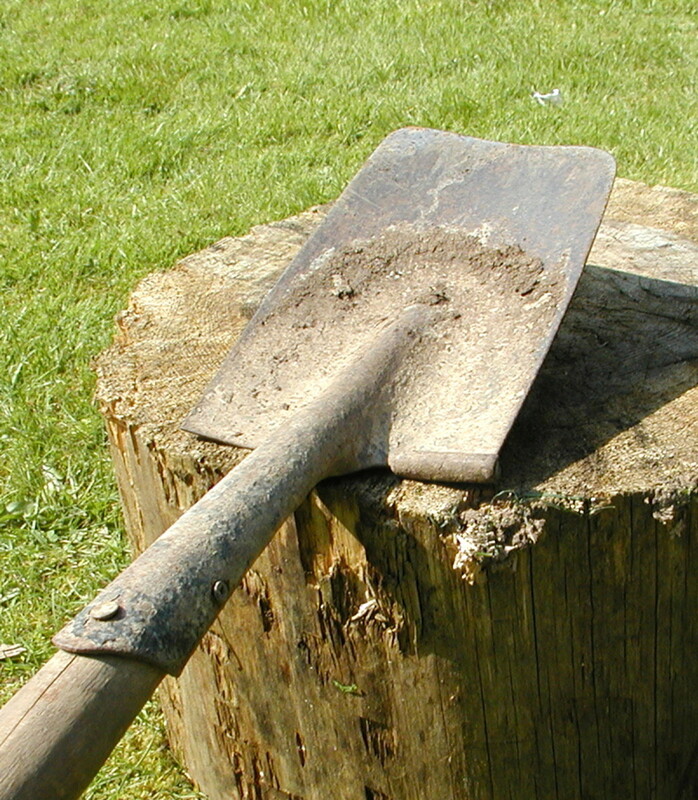 If you attempt to cut wood, rubber or similar materials with a greater friction coefficient than steel, sawdust is likely to buildup around the disk, burn, clog around the disk and potentially cause enough of a temperature rise to melt the binding resin holding the disk together resulting in it shattering. 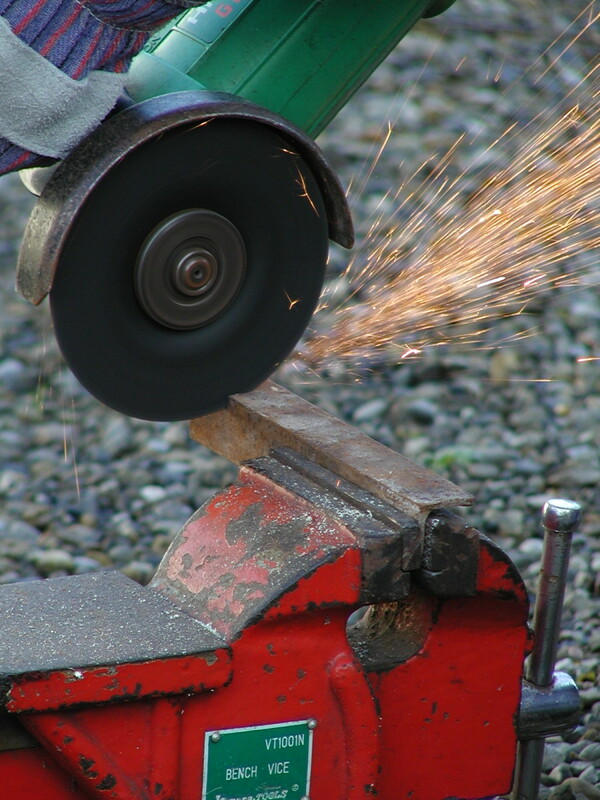 Unlike a saw or chisel blade which actually cuts and shaves through wood, a grinder disk burns its way through material. There is also the danger of the disk binding in the cut if material builds up, especially if it's buried deeply in the wood. If you don't have much wood to cut and don't want the expensive of buying a power tool, get yourself a hacksaw, junior hacksaw, tenon saw, fretsaw or similar. The appropriate power tools for cutting wood are a circular saw, jigsaw, reciprocating saw, multitool or bandsaw. Safety info starts on page 6. I'm using Bosch 670W Angle Grinder, GWS 6-100, Disc Diameter: 100 mm, what should be the safety manuals for this Angle Grinder? Thanks Bill, glad you liked it! Your explanation of the phenomenon is very clear . The powers you quote, 1200, 1100 and 900 would be watts not kilowatt (i.e "w" not "kw). Anyway for a given size of grinder, 5 inch in your case, the rotational speed will be the same for all three powers, but a 1200 watt tool is capable of producing more torque, and as a result, force at the edge of the disk, without slowing down. So it allows you to grind away material quicker since speed isn't reduced. The reason for the electric brake and kickback stop is to try to cope with the extra force the motor can produce if the disk stalls completely or semi-stalls. The kick-back phenomenon is due to both the angular momentum of the disk, and also the reaction of the workpiece due to the torque of the motor. So there is a potentially greater risk with the higher power machine (just as there is with a larger 9 inch grinder), but the safety feature is supposed to cope with this risk. The higher powered machine will let you work faster but is likely to be more expensive. Hi Many thank for your blog. Do you know if the risk of lose control or brake the disc is the same with a 1200 Kw, 1100 Kw, 900 Kw... 5" angle grinder. I want to buy a grinder. I've never cut PVC pipe with a grinder until today, usually I just use a hacksaw (or a reciprocating saw can be used). If the wall of the pipe is thick, e.g. heavy gage plastic gas line, heat could build up with the disk buried in the wall of the pipe, and friction could probably produce enough heat to cause the plastic to smoke. In any case unless you are cutting pipe regularly on a day to day basis, I would doubt whether the fumes would have any detrimental health effect. I tried cutting some 1 1/2 PVC waste pipe. There was no smoking or fumes, just a slight smell of hot PVC. It's important to use light pressure. Excessive pressure increases friction and this may cause burning. Cutting produces very fine PVC dust so it's best to use a dust mask. I was reading about the dangers of burning PVC pipe. Apparently burning PVC releases dioxin gases (nasty cancer causing gas). I figured that angle grinding PVC would release dioxin gas, seen as materials cut using an angle grinder heat up quite a bit. Do you know if cutting PVC with an angle grinder does in fact cause the release of nasty gases? Hi Hal, I don't see any reason why you can't grind while sitting down as long as you deflect the sparks away from you. The only danger I can think of is that if the grinder slips out of your hands, it is likely to drop down onto your legs or knees, causing injury. If your legs are under a bench, obviously this is less likely. Also make sure the workpiece is well secured, otherwise if it is small and the disk catches it, it can be thrown towards you. In the photos I am grinding while bending down and personally I find it a better way of bracing my arms by keeping them outstretched. You can also work at a bench with the work piece held in a vice. When grinding metal that is below waist level is it ok to sit and grind. I find this position to be most comfortable than bending awkwardly. Hi Kevin. The sparks will always travel towards you as the lower side of the disk is traveling towards you. You can let the sparks fly between or to one side of your leg. Also by cutting from the back of the metal, similar to the way timber is cut with a chainsaw, if the grinder binds it will be pulled away from you. This is safer than cutting from the front as the disk can be thrown up out of the cut. When grinding, you can hold the grinder so that the disk is angled about 15 degrees from the horizontal and sparks can be thrown fully away from you.